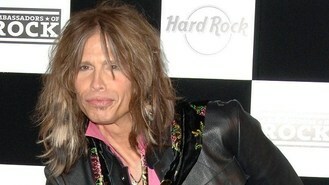 Aerosmith has had its share of feuds, most recently in 2009, when the band were forced off the road when Steve, 64, injured himself falling off the stage. While on a break, Steve appeared on the music talent show for two seasons before announcing he was stepping down this summer. Steve told Absolute Radio's Russ Williams: "It was great, it was a bit of a risk in the beginning, I wasn't sure what I was doing, I did it out of anger, the band was going through stuff and I went away somewhere to get a good look at what was going on, I'd just finished the book and a bunch of things and I just said 'Get me Idol.'" But Steve said he is grateful to Idol for giving the band a big boost. He revealed: "After the first year the Aerosmith ratings went up 270 per cent, every time someone sang Dream On or Don't Want To Miss A Thing, you know our songs went up on ITunes, it was a good thing." During their most recent feud guitarist Joe Perry - who quit the band in 1979 to go solo but returned in 1984 - had claimed Aerosmith were looking for a new lead singer to replace Steven while he recovered from his injuries. But Joe agreed with Absolute Radio DJ Russ that losing a member of the band was like losing a limb. He added: "I don't know how the band worked when I wasn't in it for four years. You know, you can tell more about it than I can because I wasn't there, but you know Aerosmith continued after I left but it wasn't like some of the, I'd say shining highlights of the band's career. So I think it's all about the team work."